This is the second article in this series. The first, on training for novice boulderers, should be read before this one, training programs for bouldering-intermediate. As I wrote in the last article, we often like to think of ourselves as being more advanced that we are. I tend to do this in the realms of cooking, finance, and personal hygiene. I’ve been dealing with all three of these things since I was a teenager, but have never really put in anything more than minimal efforts. Since I still tend to mess up cooking spaghetti, don’t have an impressive investment portfolio and I cut my own hair, I should still be considered a novice in these areas. I use the terms novice, intermediate, and expert to give an indication of training age and experience breaking through plateaus. This was not my idea – it’s borrowed from coach Mark Rippetoe, who writes wonderful books about weight training. It’s a good model for judging how one should be training…why try to do an advanced program when you don’t have to? If you have never really stopped getting better by just climbing, you’d be classified as a novice – no judgment attached. 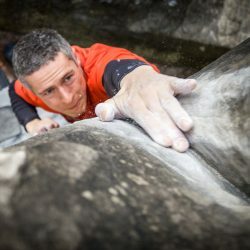 This article is intended for climbers who have been at it for a few years or more and have found what they fear is their “level” – a place where they just seem to be stuck at the same grade season after season. As frustrating as this can be, it’s often an easy fix. We usually try to move the climber away from climbing-only as training and look at scheduling specific weeks for overload and recovery. In the two programs I suggest below, you’ll see that we focus one step deeper than just getting better at bouldering, and instead look at trying to develop specific facets of the sport over the course of targeted training cycles. 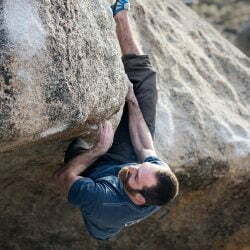 This gives us the opportunity to once again provide an overload to the body’s systems, something that likely no longer occurs with the same old bouldering routine. The training of the intermediate is more restrictive and focused than the novice’s plan. There is a big caveat here that I think a lot of people miss: advanced programs aren’t somehow magically better than less advanced ones – they simply apply greater structure and load. These are two things that one should not seek out until all other avenues have been exhausted. The intermediate program is where you’ll start seeing two major categories of exercises that are outside the realm of climbing. General Preparatory exercises will range from cardiovascular-style training to weights to mobility work. Specific Strength exercises will be more climbing-specific tools used to advance particular facets of climbing movement. 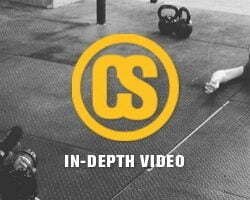 These include deadhangs, lock-off training, systems work, power bouldering, etc. None of these exercises will be unfamiliar to most climbers. How to implement them correctly might be. I don’t cover specifics in this article – this is simply about building the program. We use two basic training plans for our intermediate boulderers: an Alternating Linear Cycle and a 3-Stage Accumulation Cycle. I’ll outline each of them below. I’ve covered this one before. It’s the best of the simple periodization models simply because it’s the most simple. Training is planned in 4-week or 1-month blocks, and you alternate between two different training “months”. Month 1 is a strength and power focused month with three weeks of gradually harder training followed by a recovery week. Month two is aimed at developing work capacity and, God forgive me for recommending it to a boulderer, endurance. The second month is structured the same as the first, with three weeks of build followed by a recovery. The best way to start this program is to look at exactly how much you have been training each week for the past several weeks. If you have no idea at all, I suggest you do the novice program for a month and figure out what kind of volume you can handle. Once you know how many hours per week you’re training, you can plan week 1. Weeks two and three will be roughly the same duration, but with an active effort toward going harder (doing harder problems, more difficult hangs, etc.) rather than for more time. Week four will see you maintain the same intensity from week three, but with half the total training time. This rule is critical and non-negotiable. The sessions in month 1 should include 2-3 bouldering sessions per week, 2 hangboard strength sessions, 1-2 strength resistance training sessions, and 1-2 special strength sessions on the system wall or doing skill training on the bouldering wall. You’ve got to understand why my recommendations here are not more explicit – this program is for ALL BOULDERERS. No two of us need the same exact things out of training. Want more exact recommendations? Shoot me a question via email. Month 2 will consist of trying to do more stuff at a lower intensity. Each week, you’ll look for more total work to be completed, which is usually a reflection of more training time. You don’t want to let your strength and power slip, though, so make sure to keep 1 hangboard strength session and 1 bouldering session in the plan. On top of that, you’ll want to add 1-2 density sessions, some linked-problem workouts, and at least two “extensive endurance” type sessions. The latter are simply long traverse days, mileage days on a rope, or ARC-style sessions. The traverse days have to be done with impeccable technique and should be done on a variety of angles and hold types. 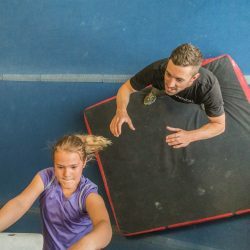 My main criticism of ARC training is that most people just do “open” traversing in a climbing gym, reinforcing their bad habits and crap technique. Don’t do this and you’re golden. I’m also a big fan of “cardiac output” training in this phase. This is slow-paced cardiovascular activity that should aid in recovery, general endurance, and weight management. Remember, this phase is all about accumulating lots of work, so don’t worry about pushing the intensity. Activities that use your upper body muscles such as rowing, skiing, or easy circuit training are arguably better for building endurance and work capacity for climbing, but it hasn’t been studied extensively. This is a similar plan to the last, but features a peak of sorts at the end of the training cycle. This is appropriate for people trying to build for specific trips or projects. The plan starts with a 6-8 week “accumulation phase.” This phase features a gradual build-up in overall training volume while trying to see modest improvements in strength and power as the cycle progresses. We follow the accumulation phase with a solid recovery week, and then start a 3-4 week intensity cycle. This cycle involves really upping the difficulty of every session, and usually results in a drop of about 20-25% training volume per week. We need to be careful about dropping off too much, as that tends to result in a decrease in overall conditioning. After the intensity phase, we roll out to the peaking phase, where for three to four glorious weeks you just try to go bouldering. The way you “earn” this is to build enough of a fitness base that your strength and power stay relatively persistent and allow for a long-term peak. The longer you make the accumulation and intensity phases, the longer this peak can last. same format with increases in overall total work each week. back off as needed, probably to volume of week 2 or so. same format as week 1, except trying to increase training load / difficulty each week. Hard bouldering with rest as needed. Probably most effective at 3-4 short sessions per week. The nutshell version of this plan is this: do as much stuff as you can for the first few weeks, then do harder stuff, then do even harder stuff with more rest. Again, remember this is an example and not your new training program. You’ve got to build a plan from where you are, not from where you wish you were.